The thoughts of Vaikunda Ekadasi is replete in mind ~ almost the whole day spent at Temple related activities… I have posted with pride the Vaikunda Ekadasi, which heralds the starting of ‘Irapathu Uthsvam’ ~ tens of thousands of people thronged Sri Parthasarathi Swami temple at Thiruvallikkeni divyadesam and thousands had His darshan when the Irapathu purappadu day 1 occurred at 01.30 am this morning….. and there were more than a thousand hearing Thiruvaimozhi goshti and received His theertha prasadams………… very Happy feelings of a Srivaishnavaite. 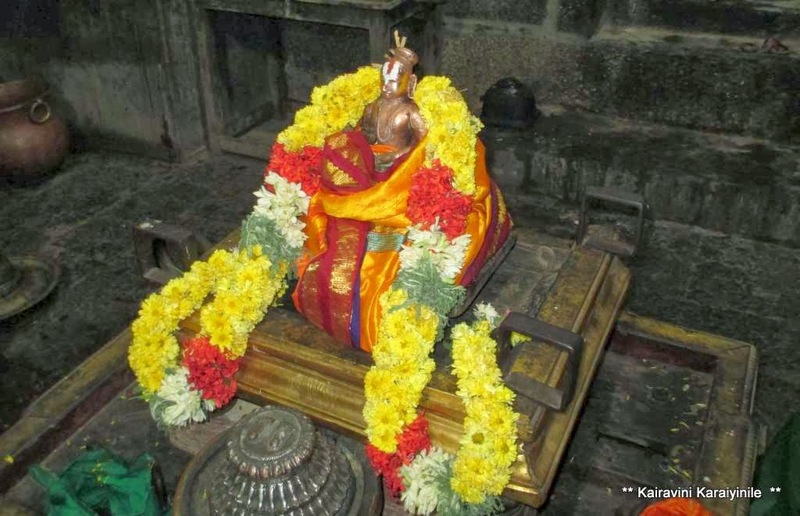 I was immensely delighted to have darshan of Sri Vaikunda Perumal and attend Thiruvaimozhi muthal pathu at this temple, which makes me write this post ~ in fact more of an appeal requesting you to visit this place and support the kainkaryam that is being rendered by dedicated people here. 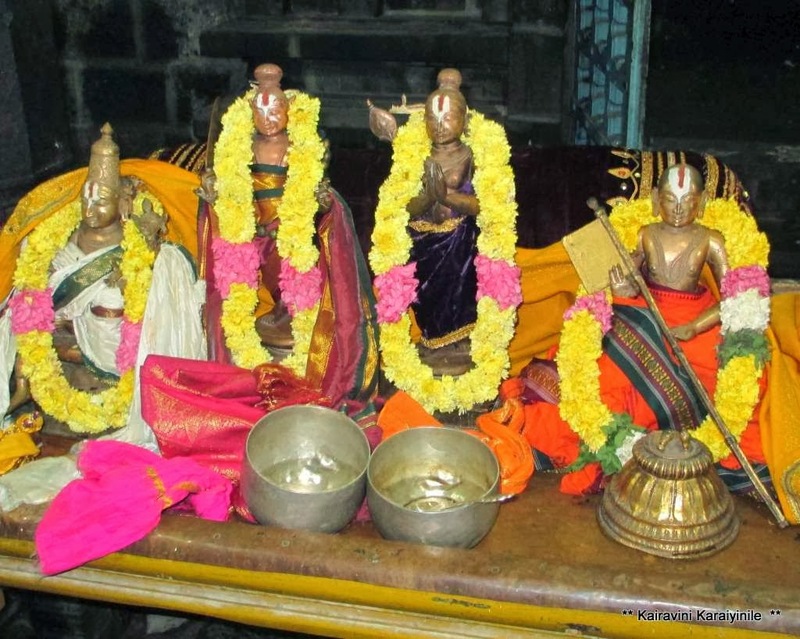 Madhuramangalam is the birth place of Swami Embar ~ a cousin of Sri Ramanujar, Embar was born as Sri Govindar in Madhuramangalam (then known as Mazhalai mangalam) in Krothana Samvatsaram (1026 AD). Embaar born to PeriyaPiraati and Kamala Nayana Bhattar . 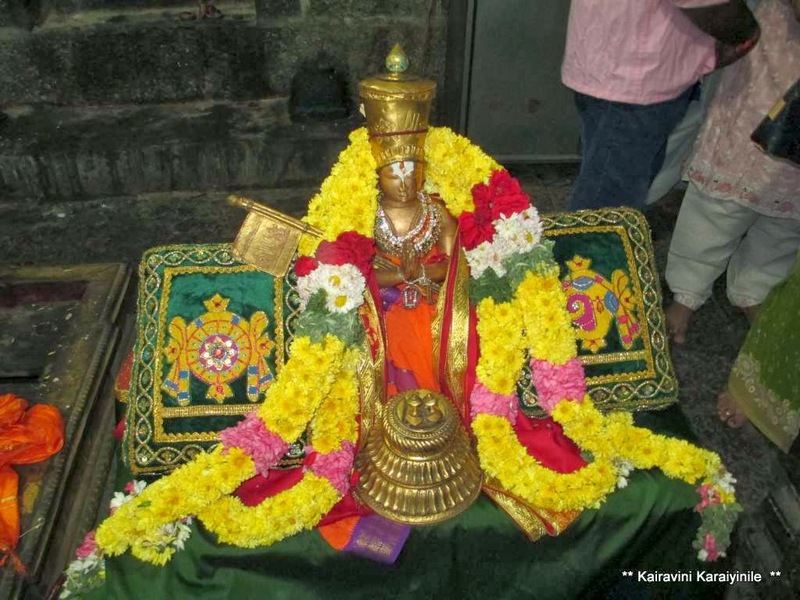 Swami Ramanujar is known as the incarnation of ThiruAnanthazhvan and Swami Embaar as the incarnation of Periya Thiruvadi . 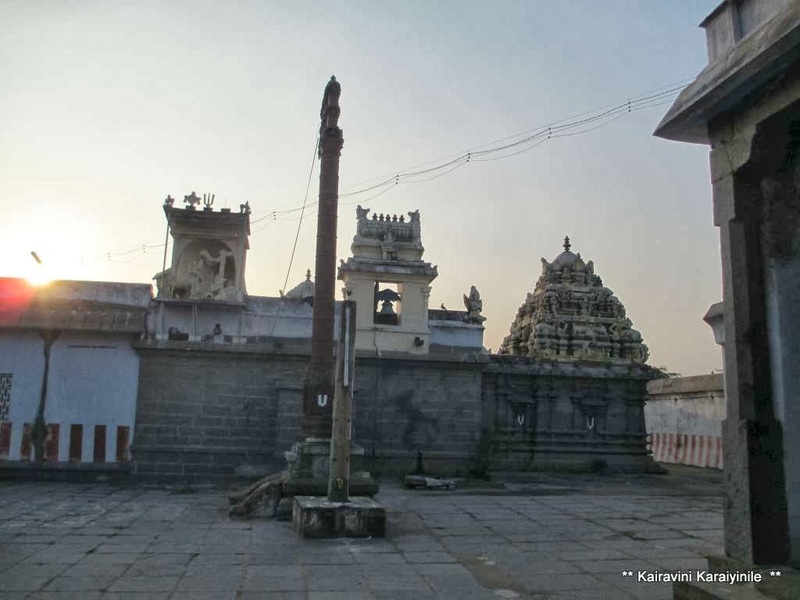 Arising out of his connection to Periyathiruvadi, the Theertham of this temple is known as Garuda Pushkarini and it is believed that at this place any snake or poisonous insects will not harm anyone. 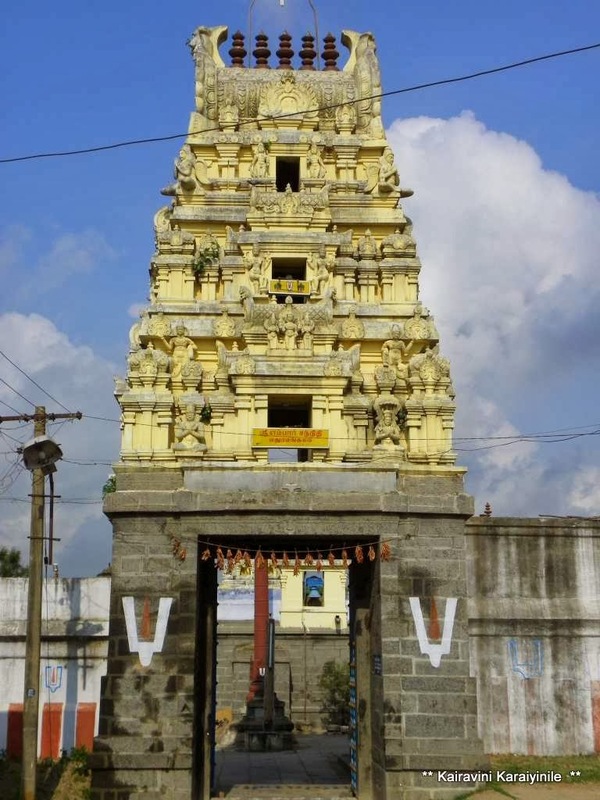 The Avathara Mandapam of Swami Embaar is located around ½ km from the temple. Govinda studied under Yadava prakasar and rescued Ramanujar from the plot- that the Guru Yadavaprakasa hatched. Swami Embaar was exceptionally attached to Sri Ramanujar and followed him as a shadow would trail a person. A great contribution to Vaishnavism is Embar being the acharya to the greatest Sri Parasara Bhattar (son of Koorathazhwan). Legend has it that when Udayavar asked Embar to bring baby Parasarar for naming, Embar by way of protection muttered Dvaya mantram in the infant’s ears and that placed on the baby unusual brilliance. Upon instruction of Udayavar, Embar became the Acharya of the baby and thus vaishnavaites are endowed with a great Acharyar – Sri Parasara Battar. He attended Ramanujas all lectures, discourse, debates expositions and dispositions and served his master as a shadow. With great resolve and commitment, he secured sanyasa from Udayavar and obtained robe of an ascetic. Udayavar named him Emperumanar but he could not accept this and pleaded that he did not deserve this honour, upon which Udayavar called him “Embar”. Swami Embar’s work ‘Vijnaasthuthi” is forever remembered by posterity. This temple not being located on the mainstream has lesser number of people visiting. All the Uthsavams are being conducted well…. 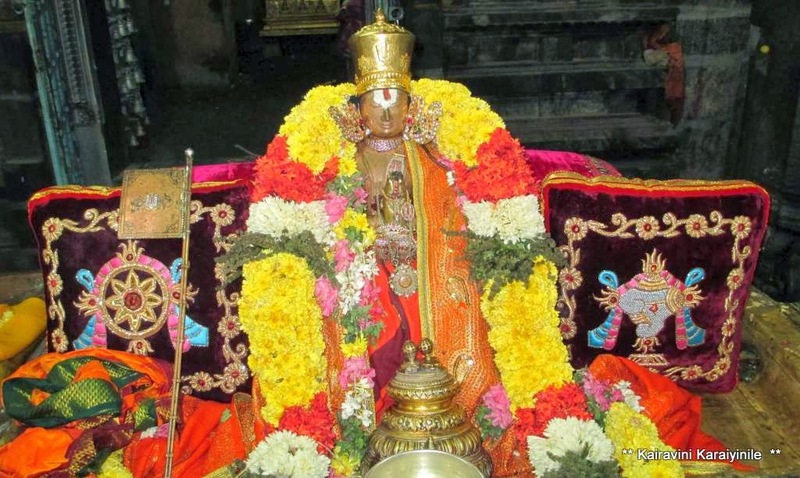 Now the Adhyayana Uthsavam is on….. yesterday was day 1 of Irapathu Uthsavam – a group of us had travelled from Thiruvallikkeni and rendered Thiruvaimozhi muthal pathu. The resources here are extremely limited ~ there is shortage of man-power (not to mention of the finance) …….yet the festivity is grand - the efforts and dedication of Sri Balaji Swamin (9500837398) deserves special mention…. 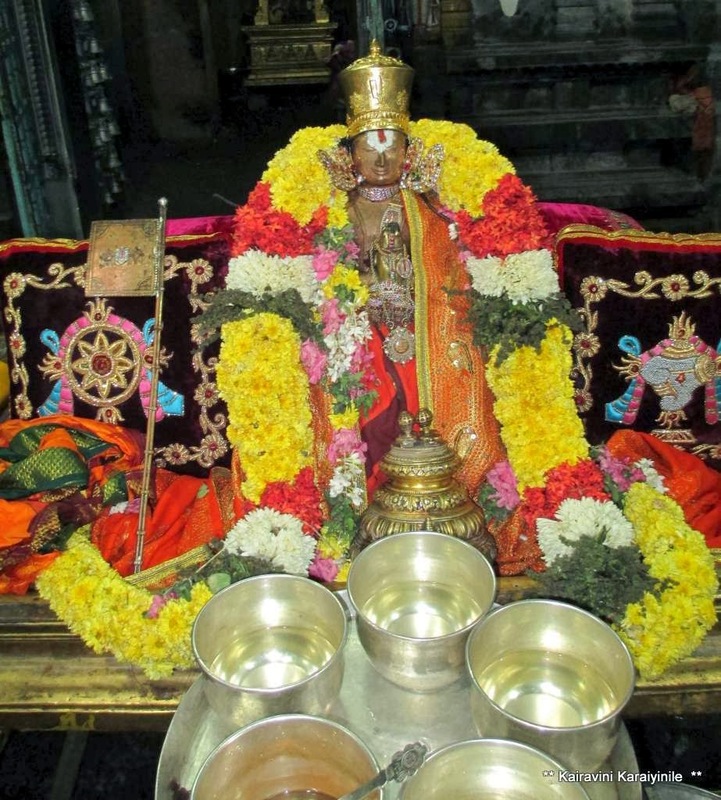 He ensures that the festivities are on in a grand manner ….. he ensures Arulicheyal goshti; he assists and ensures prasadam for Perumal and Embar………. Understand that for the goshti, Srivaishnavas from Kanchipuram travel by vehicle and the transportation cost alone would be more than Rs.1000/- these days… it is bounden duty of every Srivaishnavaite like us to visit these temples associated with great Acharyars and partake in the kainkaryams happening there. At every of these divyadesams and Srivaishnavaite temples, there are a couple of people, who live selflessly, surrendered to the Holy feet of SthalapPerumal and doing great kainkaryam continuously without any break. It is exceptional – it requires great sense of commitment, morality, will-power and exceptional dedication to be one ~ I was really moved by the gesture of the Battar, Sri Balaji Swamin and paricharakar here. 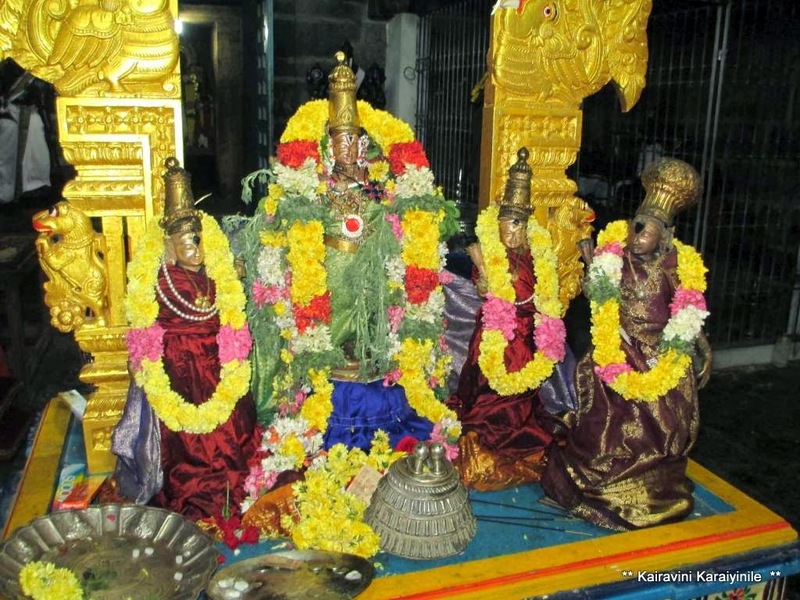 The moolavar here is Sri Vaikunda Perumal and Thayar is Kamalavalli thayar. There is a sannathi for Swami Embar and Andal. It is our duty to support these people and ensure that kainkaryams continue unabated in all these temples.